Mattress protectors are the kind of game-changing home item that many people still don’t use, and everyone should really give them a try. While your mattress can be used with just sheets or a mattress pad, a mattress protector does wonders to add to the warranty time, longevity, and cleanliness of your favorite mattress. Why wouldn’t you want to try to get these benefits? Let’s take a closer look at the best mattress protector choices of 2018, including a buyer’s guide and additional FAQs about mattress protectors and all they can do for you. How to Wash a Mattress Protector? How to Protect Mattress from Bedwetting? Why Get a Mattress Protector? What Kind of Mattress Protector for Memory Foam? LinenSPA creates affordable, quality linens that protect your mattress, box spring and other parts of the bedroom from damage caused by everyday activities and accidents. This mid-range product stands out for how quiet it is, how easy it is to use, and the huge variety of sizes that it is available in. No matter what you are trying to protect against or what size mattress you need to protect, this protector might be the exact fit for your home situation. This mattress protector is an encased protector with a zipper which makes it very easy to put on and remove even though it covers the entire mattress. The zipper is located on the side, so it is easy to slide the mattress in and out of the protector for cleaning purposes. A huge plus of this specific mattress protector is that it comes in 10 different sizes. From a twin bed to a California King size, you can find the right fit for your mattress in this same quality protector. When you have the right fit, your mattress is better protected. This protector is also super quiet! The thin, soft material absorbs water very slowly, and the material itself doesn’t make any frustrating noise that will keep you awake at night. Plus, the breathable material prevents night sweats! One big drawback of this protector is that it is water resistant and not waterproof. This is largely due to the noise-less, thin construction, but it will not protect your mattress from a major accident. Still, if you’re not in need of full waterproof protection, it is a good choice. Another negative is that it is suggested that you drip dry this protector and only tumble dry on low if absolutely necessary. This is to keep the water-resistant coating from breaking down, but it can be hard in practice. Another interesting mattress protector choice is the LeisureTown Queen Mattress Protector for its deep pocket and fitted design at a great price. This fitted-style mattress protector is made to fit a range of queen size beds without needing to know the exact depth measurements which makes it a great gifting choice or easy selection. Additionally, it’s inexpensive but still provides all the necessary benefits of a protector: coolness, cleanliness, and comfort! Swiss 100% Waterproof Membrane----All of us have experienced unexpected "accidents" or occasional breakfasts in bed spills. So protecting your mattress investment should be a top priority. Our mattress protector, with advanced Swiss 100% waterproof Membrane, will be your accountable protection, repelling effectively all liquids including bodily fluids, perspiration, urine and accidental spills.Prevent fluid accidents from permanently soiling your mattress. HNN COOLING TECH--- HNN cooling tech is adopted in order to increase air flow and make mattress protector more breathable. The waterproof membrane allows air to pass while blocking liquids. Sleeping cool and comfy without changing the feeling of your mattress. Combed Cotton Top----Soft combed cotton terry surface wicks away moisture and keeps you cool. It effectively protects you from stains so you can even naked-sleep and just enjoy the soft touching without crinkling! Fitted Sheet Style& Easy To Keep It Clean: Just throw these in the washer and dryer, and they're ready to once again protect your bed. The fitted sheet style ensures it won't slip off the bed and will stay in place. This protector is outfitted with very deep fitted corners which allows it to easily slide over any queen-size mattress without struggling to get it to fit properly. Another benefit is how super soft the whole protector is. The cotton is very light and comfortable, so you won’t feel like you’re laying on top of a piece of plastic like you might feel with other mattress protectors. Finally, you can wash this one so easily; toss it right in the washer and dryer, and you’ll have a fresh mattress protector in no time at all. Could it get any easier than that? While this protector keeps lint, dust, and other things from building up on your mattress, you can really tell how well they build upon the protector. It will need to be washed around once a week to feel clean. Thankfully, you can wash it at home. Another drawback of this design is not 100% waterproof; it is highly water resistant. This is a common problem you will find with comfortable protectors as you cannot have something 100% waterproof without it being very uncomfortable or very noisy, so the high level of water resistance is a worthwhile compromise. 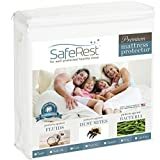 Another interesting choice for mattress protectors comes from SafeRest. Their hypoallergenic, waterproof protector is a great value, and it is easy to find the right fit. This mattress protector is available in six different sizes, and all are a deep, fitted style design which means they can fit a range of mattress thicknesses. This flexibility along with the thin, breathable fabric which keeps you cool is what makes it such a smart choice for those shopping for mattress protection on a budget. A mattress protector does nothing for you if it doesn’t fit. The six sizes of this protector all fit a variety of mattresses thickness without sliding around while you sleep. Since it stays in place, your mind can rest easy that your mattress is being thoroughly protected. Additionally, this protector is very quiet! For anyone who has suffered from the loud crinkling of a vinyl mattress protector, worry no more! This one does not have any vinyl, and it is super quiet. The terry material absorbs sound very well. A big drawback for this type of protector is that the sides of your mattress are still exposed to potential spills or accidents. If splashes or large spills are a huge risk, look for a fully encased protector instead of this type of fitted mattress protector. Another drawback is that while the terry-like material dampens any potential noise, it also absorbs the liquid. This is good at first, but if it absorbs a large spill, it can absorb it so much that it actually still reaches your mattress. So, this protector can only be considered water resistant. A super affordable option from Utopia bedding, this bamboo-infused mattress protector is for those who want a cool, comfortable night. The supercooling blend of fibers makes this mattress protector the best choice for those that overheat at night and are also worried about the possibility of a spill. Its six-size range can work on any (or all) beds in your home very easily. Full size mattress protector measures 54 x 75 inches - fits up to 15 inches deep; fitted cover style design with elastic all around. Cooling ultra-tech polyester and viscose rayon derived from bamboo blends to keep you comfortable throughout the night. Provides durable construction and protection; keeps your mattress dry since it is waterproof. Machine wash cold, tumble dry low; do not iron; do not bleach; do not use fabric softener. Great for people with kids, pets, etc. For owners of memory foam mattresses, you’re probably aware that memory foam mattresses can make you very hot at night! This type of mattress cover is a great way to cool down. The blend of bamboo and polyester keeps you cool while retaining the comfort of the memory foam mattress. 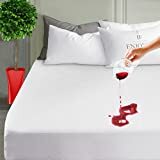 The material in this protector is very absorbent, so you won’t have to worry about spill seeping through to your mattress as long as you remove it quickly after a large accident. The moisture stays in the protector and off of the mattress for a longer period of time than most water-resistant protectors. Since the protector is so absorbent, it can be difficult to launder. It holds a lot of liquid, so it can actually throw off the balance of a washing machine. Be sure to follow the washing instructions carefully or you can ruin the water-resistant coating on the top material. This particular design can be loose on mattresses that are less than 15” thick. There is too much material for that size, so the protector may slide around. The final, affordable option today is this choice from Lighting Mall which stands out for its premium, lifetime warranty. Alongside a great lifetime warranty, this mattress has a solid degree of both comfort and cooling features which keeps you comfortable all night long without needing to readjust your blankets. It is available in four sizes. Top Protection Against Fluids, Urine, Perspiration, Accidental Spills, Allergens, Bacteria and Dust Mites. Hypoallergenic Cotton Terry Surface with Membrane Back Coating - Waterproof, Vinyl-free, Soft, Noiseless and Breathable. 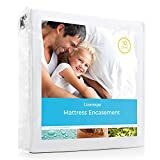 Mattress Protector Full Size 54" x 75" - Fully-elasticized Fitted Sheet Style with Deep Pockets for a Smooth, Secure Fit on Mattress depths up to 14". Great for Those with Kids, Pets, Allergies, Asthma, Eczema or Incontinence. Easy Care, Machine Wash Cold, Tumble Dry Low, Do Not Iron, Do Not Bleach. 100% Lifetime Worry-Free Guarantee. Love This Mattress Protector Or We Will Send All Your Money Back! The material on this protector is a terry-like cloth that keeps your cool in bed and protects your mattress without being noisy. You don’t have to worry about anyone’s tossing and turning keeping you up since it is relatively quiet to use. Another benefit is the warranty. If you have problems with the cover, customer service will be sure to help you find a solution to the problem you are having. This benefit is worth a lot if you need to use it. This mattress protector is not a great choice for those who need the protector to fight off large spills or accidents. While it does have some degree of water resistance, it doesn’t offer a lot of protection in this area. As this protector is only available in four sizes, it can be hard to find one that will fit your mattress as you would like it to. This can cause sliding around which may be frustrating to deal with. Whether you’ve owned a mattress protector before or it is your first time investing in this protective choice, there are a few things that you should know to pay attention to in order to make sure that you get the right fit. From warranty considerations to size, your mattress protector should be chosen carefully. Let’s take a closer look at everything that matters when choosing a mattress protector! There are a few different ways that mattress protectors can be attached to your mattress. Depending on your box spring, mattress, and bed frame, one of these types might work better than the others. All of these types of mattress protectors have their pros and cons. This list only outlines a few of those; consider how you like to change your sheets and the space you have available; to do so to figure out which type of protector will work best for you. Each of these materials has their pros and cons. If you prefer something waterproof, you will want to choose a material that is made of vinyl or polyurethane. Otherwise, you’ll have to find something with another type of waterproof coating applied to the material. For easiest cleaning and lightest breathability, a cotton or polyester mattress protector is probably preferable, as they are the simplest to take care of. No matter which material you choose, remember to follow that protectors care instructions closely so that the protector lasts for many years to come. Size is a very important consideration when choosing a protector. Ensure that whichever protectors you are looking at purchasing are available in the sizes that you need. Additionally, consider whether or not the protector will need to fit over a pillow top or other mattress pad. Some people like to put their mattress pads on top of the protector; others do things in reverse. Regardless of which way you decide to set it up, you must be sure that the mattress protector will fit the width, length, and depth of the mattress snugly so that it stays in place and works effectively. Finding a waterproof mattress protector is easier than ever before, so you can breathe a sigh of relief! From protectors coated in waterproof materials to those made of things like vinyl which either repel or absorb water, your mattress will be safe from moisture. Having a mattress protector that is waterproof is very important because water and moisture can easily cause the materials inside a mattress to degrade, and they can also cause staining. Both of these things are harmful to long-term mattress usage, so you should aim to avoid them at all costs. The final factor that you will want to look at when it comes to your mattress protector choices is warranty. There are two different reasons to consider the warranty. First, you want to see if the mattress protector itself includes a warranty and what that warranty entails. In some cases, the protection will include protection for the mattress itself. Check the details before making any final decisions. Second, you want to check what type of warranty you have on your actual mattress. Do stains void the warranty? What about other types of wear? Depending on the answer, you will want to make sure you choose a type of mattress protector that prevents your mattress warranty from being voided by regular use. Every mattress protector will have its own specific instructions that should be followed when cleaning the protector. Still, if you lost the instructions or cannot understand what they want you to do, the following directions will help you keep your protector in tip-top shape. Generally, you can machine wash on warm and tumble dry on low. There are YouTube videos available to help you with the process if you have other questions. ​A mattress protector is an item of removable bedding that sits on top ​or encases, a mattress to protect it. 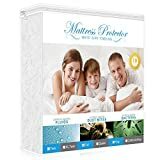 Some mattress protectors also provide protection to the person sleeping on the mattress from allergens and irritants such as dust mites, bed bugs, mold, and dead skin (like dandruff). How to Protect Mattress from Bed Wetting? One big way that mattress protectors are often used is by parents when their children are going through the bed wetting phase. Believe it or not, there are specific mattress protectors out there that are meant to help prevent liquid from penetrating the protector and getting into the mattress. Urine would be a big problem if it made it to your mattress, so having a waterproof mattress protector is a great idea if you have a bed wetter at home. The protector keeps the mattress from absorbing sweat, skin cells, and other “gross” things that are just naturally on our body. Since you can wash the mattress protector, you can wash away any buildup that occurs on your bed while you are sleeping. Without one, your mattress may absorb those things like a sponge. Do you struggle with dust mite or other at-home allergies that flare up when things aren’t clean? If so, then starting to use a mattress protector might help prevent the raspy voice or sneezing that you fight off because of such allergies. Dust mites are attracted to dead skin cell buildup, so washing your protector regularly fights them off. Stains, ripped edges, and more can actually cause your warranty to be null and void on your mattress. Even if the stain has nothing to do with the warranty issue, you might be out of luck if you aren't careful. For that reason, preventing stains from setting with a mattress protector is key to keeping your mattress in good condition for many years to come. When it comes to a memory foam mattress, the key is that you choose a mattress protector that is thin and breathable. Memory foam works largely because of the way it stores and releases air, so a thick mattress protector can impede its functionality. Stick to thin, breathable covers for the best results! Among these great mattress protector options, the top choice is by far the LINENSPA Encasement Breathable Mattress Protector. This protector has the best quality, highest degree of waterproofing, and is easiest to use. It will protect your mattress from nearly anything. 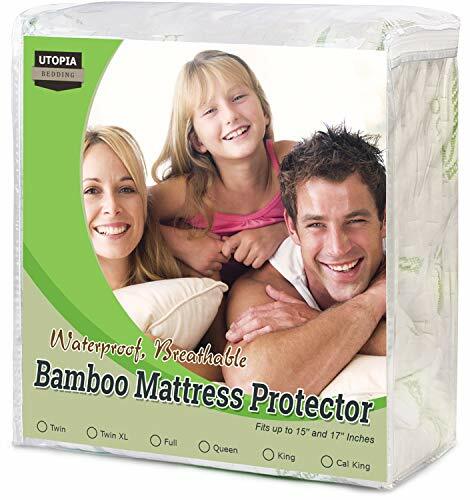 An alternative that is good for those with memory foam mattresses is the Utopia Bedding Waterproof Bamboo Mattress Protector as it will help to keep you cool while still protecting your mattress from accidents.